Remove kale stems and chop kale finely. Heat oven to 350°. Toast nuts for 5 minutes. Heat olive oil in medium frying pan. Cook chopped garlic for 30 seconds. 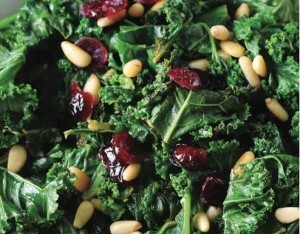 Toss in kale and cook on medium-low for 4 minutes. Toss in raisins and cook for 1 more minute on low. Turn off heat, add toasted nuts, and mix. Add salt to taste.